This student submission comes from my former student Kelsi Kolbe. Her topic, from Algebra: completing the square. A2) How could you as a teacher create an activity or project that involves your topic? When students are learning how to complete the square they are usually told the algorithm take b divide it by two and square it, add that number to both sides. To the students this concept seems like a ‘random trick’ that works. This can lead to students forgetting the formula with no way to get it back. 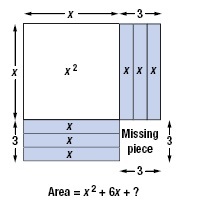 However, if we show students how to complete the square using algebra tiles they will be able to understand how the formula came to be (pictured to the left). This will allow the students to be able to have actual concrete knowledge to lean on if they forget the algorithm. For an engage I would introduce them how to use the algebra tiles by representing different equations on the tiles. I would mix perfect squares and non-perfect squares. I would wait to do the actual completing the square as the explore activity. This way it’s something they can experiment with and really learn the material themselves. Muhammad Al-Khwarizmi was a Persian mathematician in the early 9th century. He oversaw the translation of many mathematical works into Arabic. He even produced his own work which would influence future mathematics. In 830 he published a book called: “Al-Kitab al-mukhtasar fi hisab al-jabr wa’l-muqabala” Which translates to “The Compendious Book on Calculation by Completion and Balancing” This book is still considered a fundamental book of modern algebra. The word algebra actually came from the Latinization of the word “al-jabr” which was in the title of his book. The term ‘algorithm’ also came from the Latinization of Al-Kwarizmi. In his book he solved second degree polynomials. He used new methods of reduction, cancellation, and balancing. He developed a formula to solving quadratic equations. 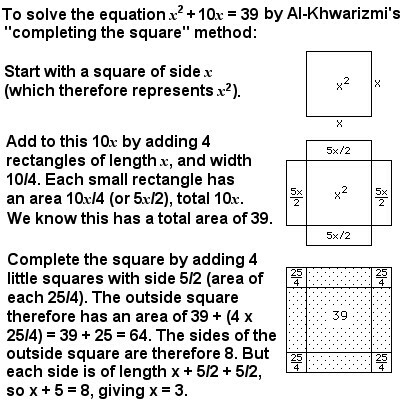 As you can see to the right this is how Al-Khwarizmi used the method of ‘completing the square’ in his book. It is very similar to how we use algebra tiles in modern day. You can really see the effect he had on modern algebra, especially in solving quadratic equations. E1) How can technology be used to effectively engage students with this topic? I found a fun YouTube video of the Fort Collins High School Math Department singing a parody of Taylor Swift’s song “blank space”. In the video they are teaching the steps for completing the square. It also addresses imaginary numbers for more complex problems. I think this could be a fun engage to get the students attention. The video incorporates pop culture into something educational. I have always liked watching mathematical parodies videos on YouTube. It not only engages the students, but if they already know the words to the song, they could also get the song stuck in their head, which will help them solve the problems in the future. This student submission comes from my former student Kerryana Medlin. Her topic, from Pre-Algebra: dividing fractions. The basic idea behind the activity is to ask the students to follow a recipe using a 1/3 cup measuring cup and a teaspoon. This will also allow them to practice dividing whole numbers by fractions, which strengthens to concept as well. They will be reminded that a whole number can be expressed as the number over one. They would be asked to figure out how many 1/3 cups each component would take. This would also help the students to use the skill of adding fractions (1 and ½ being 3/2) before dividing. The recipe would ultimately make rice cereal treats with icing on top (enough for the entire class). This is envisioned as an activity in which the students work either individually or in small groups to do the calculations and then come together as a class to provide answers and give me the proper amount of ingredients to put into the recipe. Dividing fractions involves prior knowledge from fractions, generally. If dividing by flipping the dividend and then multiplying the resulting two fractions, the student must use their knowledge of multiplication of fractions and inverses, assuming that they have learned anything about inverses at this point. If the student is taught to find the greatest common denominator first, then they will use their knowledge of greatest common denominators and basic division to find the quotient. They will also be reminded of the concept of whole numbers being expressed as fractions in this topic. Originally, division of fractions would have been thought of in terms of practical use only and was likely conceptual since the symbolism of fractions was not the clearest. An example of fraction systems that were more difficult to comprehend, would be the Egyptian system, since they would add together unit fractions to represent non-unit fractions, unless it was fraction that had a repeating unit fraction, such as 2/7 = 1/7 + 1/7 (Weisstein). When symbols became clear, the division was done by taking the fractions, finding their common denominator, then dividing the numerators and denominators, leaving the quotient. The Babylonians mostly used the method of taking the inverse of the divisor and then multiplying by the dividend (O’Connor and Robertson, 2000). This is still a popular method. Today we can do either, but some believe that doing this operation algebraically might be better for students because thinking about division of fractions in only a practical sense will stifle their imagination (Ahia and Fredua-Kwarteng, 2006). Ahia, Francis and Fredua-Kwarteng, E.. (2006) Understanding Division of Fractions: An Alternative View. The fold-and-cut theorem, which first appeared in 1721—and was later proved by MIT computer scientist/computational origami wizard/former child prodigy Erik Demaine—asserts that any shape comprised of straight lines can be made from a single cut if you can just figure out the right way to fold the paper. TED-Ed made a very good video describing the Infinite Hotel Paradox, a thought experiment to describe how injective (one-to-one) functions can be used to examine countably infinite sets. I’m doing something that I should have done a long time ago: collecting a series of posts into one single post. The following links comprised my series on using examples from popular culture to illustrate principles of predicate logic. My experiences teaching these ideas to my discrete mathematics students led to my recent publication (John Quintanilla, “Name That Tune: Teaching Predicate Logic with Popular Culture,” MAA Focus, Vol. 36, No. 4, pp. 27-28, August/September 2016). Unlike other series that I’ve made, this series didn’t have a natural chronological order. So I’ll list these by concept illustrated from popular logic. Part 98: “Call Me Maybe,” by Carly Rae Jepsen. Part 76: “You’re Never Fully Dressed Without A Smile,” from Annie. Part 109: “Dancing in the Dark,” by Bruce Springsteen. Part 122: “Keep Yourself Alive,” by Queen. Part 65: “Stars and Stripes Forever,” by John Philip Sousa. Part 68: “Love Yourself,” by Justin Bieber. Part 69: “I Will Always Love You,” by Dolly Parton (covered by Whitney Houston). Part 74: “Faithfully,” by Journey. Part 79: “We’re Not Gonna Take It Anymore,” by Twisted Sister. Part 87: “Hungry Heart,” by Bruce Springsteen. Part 99: “It’s the End of the World,” by R.E.M. Part 100: “Hold the Line,” by Toto. Part 101: “Break My Stride,” by Matthew Wilder. Part 102: “Try Everything,” by Shakira. Part 108: “BO$$,” by Fifth Harmony. Part 113: “Sweet Caroline,” by Neil Diamond. Part 114: “You Know Nothing, Jon Snow,” from Game of Thrones. Part 118: “The Lazy Song,” by Bruno Mars. Part 120: “Cold,” by Crossfade. Part 123: “Always on My Mind,” by Willie Nelson. Part 62: “All My Exes Live In Texas,” by George Strait. Part 70: “Wannabe,” by the Spice Girls. Part 72: “You Shook Me All Night Long,” by AC/DC. Part 82: “Sharp Dressed Man,” by ZZ Top. Part 86: “I Could Have Danced All Night,” from My Fair Lady. Part 95: “Every Breath You Take,” by The Police. Part 96: “Only the Lonely,” by Roy Orbison. Part 97: “I Still Haven’t Found What I’m Looking For,” by U2. Part 105: “Every Rose Has Its Thorn,” by Poison. Part 107: “Party in the U.S.A.,” by Miley Cyrus. Part 112: “Winners Aren’t Losers,” by Donald J. Trump and Jimmy Kimmel. Part 115: “Every Time We Touch,” by Cascada. Part 117: “Stronger,” by Kelly Clarkson. Part 93: “There’s No Business Like Show Business,” from Annie Get Your Gun (1946). Part 94: “Not While I’m Around,” from Sweeney Todd (1979). Part 106: “No One,” by Alicia Keys. Part 116: “Ocean Front Property,” by George Strait. Part 73: “Dust In The Wind,” by Kansas. Part 75: “Happy Together,” by The Turtles. Part 77: “All She Wants To Do Is Dance,” by Don Henley. Part 90: “All You Need Is Love,” by The Beatles. Part 63: P. T. Barnum. Part 66: “Somewhere,” from West Side Story. Part 71: “Hold On,” by Wilson Philips. Part 84: “If You Leave,” by OMD. Part 103: “The Caisson Song” (US Army). Part 111: “Always Something There To Remind Me,” by Naked Eyes. Part 121: “All the Right Moves,” by OneRepublic. Part 92: “Anything You Can Do,” from Annie Get Your Gun. Part 119: “Uptown Girl,” by Billy Joel. Part 67: “When I Think Of You,” by Janet Jackson. Part 78: “Nothing’s Gonna Stop Us Now,” by Starship. Part 89: “No One Is Alone,” from Into The Woods. Part 110: “Everybody Loves My Baby,” by Louis Armstrong. Part 83: “Something Good,” from The Sound of Music. Part 85: “Joy To The World,” by Three Dog Night. Part 88: “Like A Rolling Stone,” by Bob Dylan. Part 91: “Into the Fire,” from The Scarlet Pimpernel. I enjoyed this article from Quanta Magazine, both for its mathematical content as well as the human interest story. 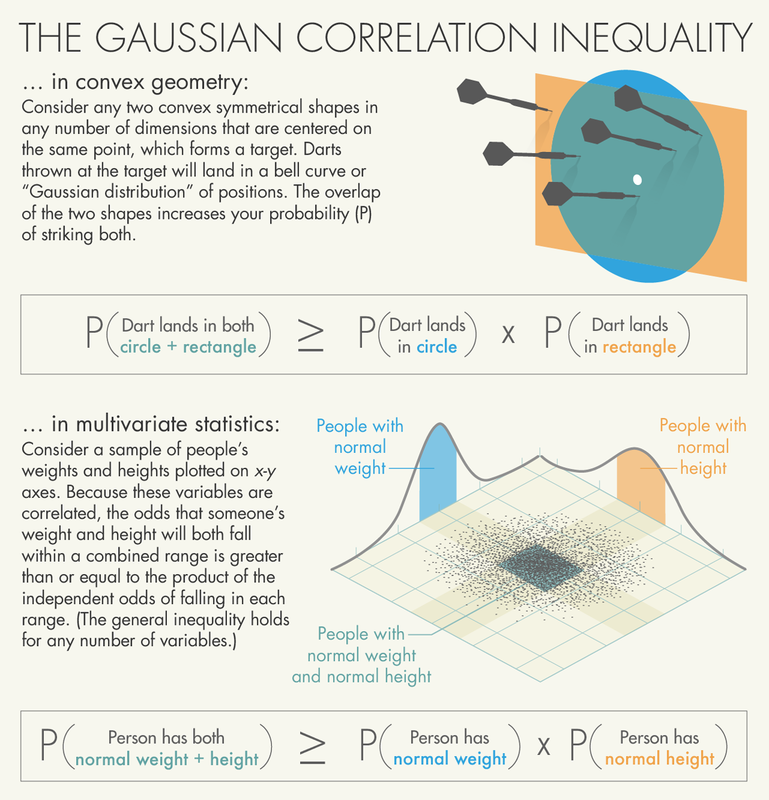 [Thomas] Royen hadn’t given the Gaussian correlation inequality much thought before the “raw idea” for how to prove it came to him over the bathroom sink… In July 2014, still at work on his formulas as a 67-year-old retiree, Royen found that the GCI could be extended into a statement about statistical distributions he had long specialized in. On the morning of the 17th, he saw how to calculate a key derivative for this extended GCI that unlocked the proof. “The evening of this day, my first draft of the proof was written,” he said. With this red flag emblazoned on it, the proof continued to be ignored… No one is quite sure how, in the 21st century, news of Royen’s proof managed to travel so slowly. “It was clearly a lack of communication in an age where it’s very easy to communicate,” Klartag said.